When you go to Zinfest in Lodi, drink water. Lot’s of it. People say it’s always hot at Zinfest. This year was no exception. Imagine tasting some amazing Zins in triple digit temperatures. It’s possible – but you need plenty of water to balance the alcohol. I also enjoyed the opportunity to do some barrel tasting. In this picture, we’re pouring a Peltier Station USB Zin Port. Delightful! Fruity, sweet and I can only imagine how good it will tasted after a few more months in the barrel. I’m a dry, complex, Pinot Noir gal. This month, my mother-in-law’s visiting us from Buffalo. She leans on the sweet end of the wine-tasting spectrum. 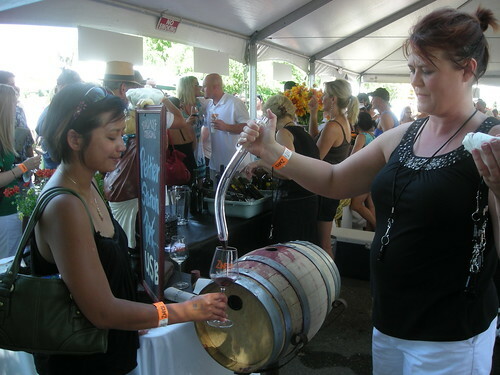 Lodi’s Zinfest had something for our palates and more. I enjoyed introducing new people to this amazing wine region. Some of our friends signed up for wine clubs down here after we took them to another Lodi wine festival. It’s a pleasure to try out all the wine products in Lodi and we learn a lot from all the charming winemakers here. Plus, it feels like family in Lodi. Folks always have time to answer our questions and joke around at the tastings. Good times for all wine fans – new and old. By the way: let your fingers do the talking. Please vote now for the Murphy-Goode Wine Country Lifestyle Correspondent position. Aka. Vote for me – please!